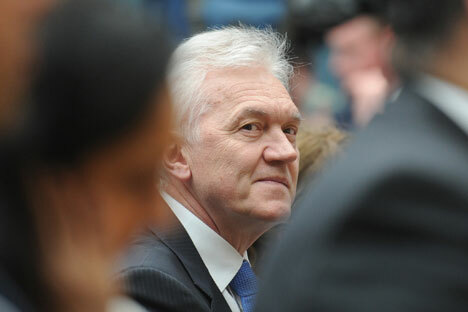 Russian-Finnish billionaire oil tycoon Gennady Timchenko has sold his share in the oil trading company Gunvor. The deal, which is shrouded in secrecy, appears to have anticipated U.S. sanctions, which have renewed the focus on his relationship with Vladimir Putin. Allegations that wealthy Russian-Finnish oil trader Gennady Timchenko owes his fortune to his close friendship with President Vladimir Putin have resurfaced following Timchenko’s inclusion on a 20-person list of individuals targeted for sanctions by the U.S.
Timchenko, whose fortune, according to Forbes, is estimated at $15.3 billion, appears to have anticipated the move, selling his share in the oil trading company Gunvor to the company’s CEO Torbjörn Törnqvist. Experts estimate the approximate amount of the deal at $2-4 billion, however nothing is known about its terms. Some analysts have suggested that the deal is a mere formality. According to a statement released by the company's press service, Timchenko sold his 44-percent stake on March 19 in order to ensure the continued smooth operation of Gunvor Group in light of the possible economic sanctions. As a result of the deal, Törnqvist now owns a controlling stake of 87 percent. The remaining 13 percent belong to Gunvor managers. Gunvor isa major exporter of Russian oil, with its headquarters in Geneva. The company was founded in 1997. Gunvor is considered one of the world's four largest oil traders. In 2010, it exported 60 million tons of Russian oil. "This decision will of course reduce the likelihood of the company's turnover and profits being affected,” Vadim Vedernikov, deputy head of the research and risk management department at UFS IC, told RBTH. The company has not disclosed the terms of the deal, and its value is also difficult to assess. "Commodity traders seek to disclose as little information as possible and the whole sector is not very open to the public, which makes company valuation vary within quite a big range," said Vedernikov. According to Vedernikov, at the start of 2013, Gunvor's market value ranged between $7.4-16.7 billion. "Thus, a year ago the market value of Timchenko's 44-percent stake in Gunvor could have amounted to $3.3-7.3 billion. Given the state of the world commodities market, the threat of U.S. sanctions against Timchenko may have reduced the value of that stake to $2-4 billion. However, it is difficult to say how the Russian businessman's deal with his business partner Törnqvist was done and what it was like," he added. Maxim Shein, head of the Investment Department in BKS, points out that there is a widespread practice of trust agreements, which allow the owner to retain control over assets without being their direct owner any longer. Mr. Timchenko thus became the first Russian businessman to react to the action taken by the U.S. Treasury. He must have seen the writing on the wall, since on March 20, the U.S. Department of the Treasury announced sanctions against 20 Russian nationals, including – in addition to Gennady Timchenko – billionaires Arkady and Boris Rotenberg, Yury Kovalchuk, and Russian Railways head Vladimir Yakunin. According to the U.S. authorities, all of them "act in the interests of or provide support to the Russian government". In a statement explaining the sanctions, the U.S. Treasury said, among other things, that Gennady Timchenko’s activities "in the energy sector have been directly linked to (Russian President Vladimir) Putin". Gunvor was swift to issue a response to the U.S. Treasury statement, categorically denying any links to Putin: "President Putin is not and has never been the owner of Gunvor. He is not the ultimate owner of Gunvor or a beneficiary from its operations. Any other interpretation is a fundamental delusion and only makes the company indignant." The statement continued: "We are currently assessing the potential impact Mr Timchenko's inclusion on that list may have on our business." The media have long been speculating that Timchenko owes his success and wealth primarily to his friendship with Putin. In 2011, Putin, who at the time was Russia's prime minister, denied rumors that he had anything to do with Timchenko's business. At the same time, he confirmed that he had known the businessman for a long time. Here is what a journalist with the Swedish TV channel SVT, Kristina Hedberg, said in an interview with Radio Liberty: "A businessman close to Timchenko says that Putin and Timchenko have skied together and have been guests at each other's dachas. Gennady Timchenko claims that he is acquainted with Putin but they are not friends. And yet they have common interests. When back in 1998 Timchenko set up a judo club, Putin became its honorary chairman." Timchenko himself, in a Forbes interview, has tried to destroy "false stereotypes" by giving an account of how his business was built. He attributed Gunvor's success to the sharp take-off of the whole Russian oil sector: "The oil companies themselves were growing. After privatization, all of them began to build vertically-integrated companies. They grew and we grew together with them." Timchenko denied that the growth of his business was connected to Putin’s rise to power. "In 2000, when he became president, I was already No. 28 on the list of Finland's biggest taxpayers, I was already a millionaire… I have been in the oil business since 1987. Do you think I couldn't make money over these 25 years?" he said.